Police outside the McColl's shop targeted by robbers. Police have issued descriptions of robbers who escaped with a "large amount of cash" from a convenience store. 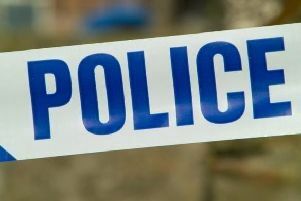 As the Mail revealed online on Thursday night, officers were called to a report of a raid at McColl's, in Elwick Road, Hartlepool, at around 7.50pm on Thursday. Staff were left "shaken" but "physically unharmed" after their ordeal. Cleveland Police said two males entered the store and demanded cash. One was believed to be brandishing a weapon or implement. The pair made off with a large amount of cash in the direction of Colenso Street and Burn Valley Park. Hartlepool MP Mike Hill witnessed the aftermath of the raid and described it as a "terrible armed robbery" to his Twitter followers. Speaking to the Mail, he later said: "I know the police were quickly and swiftly there. "It's an awful thing to happen in Hartlepool and rare in Hartlepool as well. "I hope whoever is responsible is caught quickly." The first suspect is described as a white male, of average height and build and possibly aged in his early 20s. He was wearing a black hooded jacket, a black woolly hat underneath, a dark blue scarf, grey tracksuit bottoms, light coloured trainers and fingerless gloves. The second suspect is described as a white male, also possibly aged in his early 20s, wearing a light green jacket and of average height and build. Anyone who may have information regarding the incident is asked to contact Detective Constable Darren Guest, from Hartlepool Operational Crime Team, on the non-emergency number 101, quoting event number 227187.